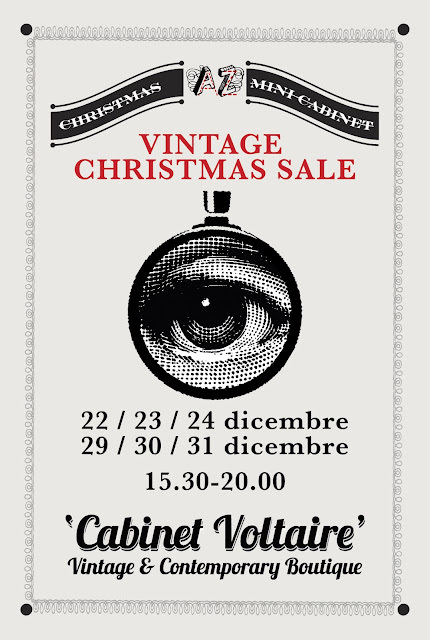 Saturday, 22 December, Lady Cipria has been invited at "Temporary Vintage Christmas Sale" that exceptionally for Christmas and New Years Eve's, leads off to the new openingof CABINET VOLTAIRE, the new show room with a pop up sale of DESIGNED VINTAGE and SINGULAR PIECES. We will be waiting for you on Saturday, 22 December: afternoon black tea Rhum flavoured with Chritsmas cupcakes. Dj set by Roby "Chickenvase" Vasapollo! Temporary will be opened on 22-23-24 December from 15.30 to 20.00 and Saturday 29-30-31 December from 15.30 to 20.00. Sabato 22 dicembre, Lady Cipria è stata invitata alla "Temporary Vintage Christmas Sale" che eccezionalmente per il Natale e il Capodanno, dà il via all'apertura di CABINET VOLTAIRE, il nuovo show room con una pop up sale di VINTAGE FIRMATO e PEZZI UNICI. Vi aspettiamo sabato 22 dicembre: tè nero al Rum delle 5 e cupcakes natalizi. Dj set by Roby "Chickenvase" Vasapollo! Il temporary rimarrà aperto il 22-23-24 dalle 15.30 alle 20.00 e sabato 29-30-31 dalle 15.30 alle 20.00.